We consider each risk's potential impact on the achievement of the group's sustainable profitability journey and our strategy as well as the probability of each materialising. 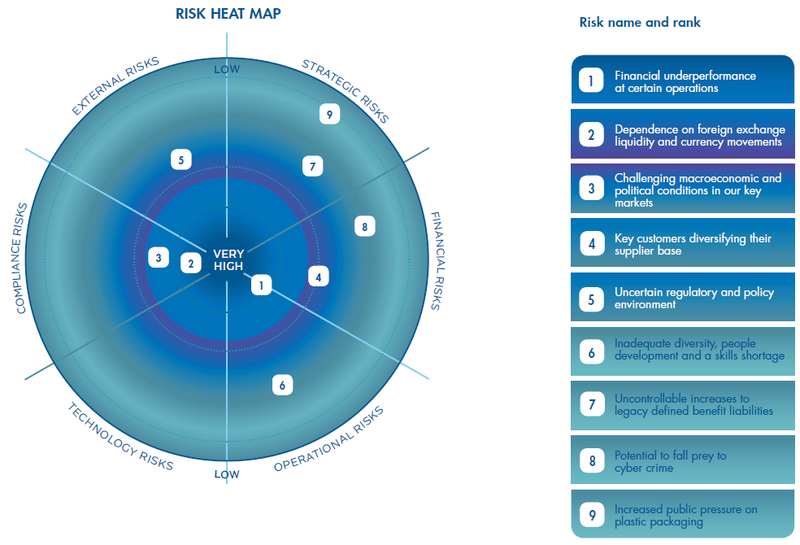 The risk rating position on the heat map reflects the residual risk position after considering the effectiveness of mitigation strategies and actions. We have ranked these risks in order of magnitude, although we recognise that these positions may change during the year. We have provided a forward looking view of the risks and opportunities that we believe may impact future performance. The icons show the links to our material issues. Our risk framework, risk management guidelines and other group policies and procedures inform our risk management culture. The risk and sustainability committee considers the material outcomes of these processes and reviews the level of risk exposure against our risk tolerance and appetite levels. Understanding our risk environment informs strategy and assists with decision making throughout the organisation. We participate in the CDP (formerly the Carbon Disclosure Project) and have formalised our assessment of Nampak's impact on the environment both from an operational perspective and also in relation to our product stewardship. Information Management Services (IMS) is a standing agenda item for the risk and sustainability committee, with ultimate responsibility for IMS governance resting with the board. In order to support the board in the execution of its responsibilities, information management and key technology risks remain a key focus area for the risk and sustainability committee.